Topology is a branch of mathematics sometimes known as rubber-sheet geometry. It deals with the properties of a geometric figure that do not change when the shape is twisted, stretched, or squeezed. In topological studies, the tearing, cutting, and combining of shapes is not allowed. The geometric figure must stay intact while being studied. Topology has been used to solve problems concerning the number of colors necessary to illustrate maps, about distinguishing the characteristics of knots, and about understanding the structure and behavior of DNA (deoxyribonucleic acid) molecules, which are responsible for the transferring of physical characteristics from parents to offspring. The crucial problem in topology is deciding when two shapes are equivalent. The term equivalent has a somewhat different meaning in topology than in Euclidean geometry. In Euclidean geometry, one is concerned with the measurement of distances and angles. It is, therefore, a form of quantitative analysis. In contrast, topology is concerned with similarities in shape and continuity between two figures. As a result, it is a form of qualitative analysis. For example, in Figure 1 on page 1898, each of the two shapes has five points: a through e. The sequence of the points does not change from shape 1 to shape 2, even though the distance between the points changes. Thus the two shapes in Figure 1 are topologically equivalent, even though their measurements are different. Similarly, in Figure 2, each of the closed shapes is curved, but shape 3 is more circular, and shape 4 is a flattened circle, or ellipse. However, every point on shape 3 can be mapped or transposed onto shape 4. So the two figures are topologically equivalent to each other. Shapes 1 and 2 are both topologically equivalent to each other, as are shapes 3 and 4. That is, if each were a rubber band, it could be stretched or twisted into the same shape as the other without connecting or disconnecting any of its points. However, if either of the shapes in each pair is torn or cut, or if any of the points in each pair join together, then the shapes are not topologically equivalent. In Figure 3, neither of the shapes is topologically equivalent to any of the shapes in Figures 1 or 2, nor are shapes 5 and 6 equivalent to each other. The circles in shape 5 are fused, and the triangle in shape 6 has a broken line hanging from its apex. Topological ideas can be traced back to German mathematician Gottfried Wilhelm Leibniz (1646–1716). However, three of the most famous figures in the development of topology are later German mathematicians: Augustus Ferdinand Möbius (1790–1868), Georg Friedrich Bernhard Riemann (1826–1866), and Felix Klein (1849–1925). Möbius is best known for his invention of the Möbius strip. 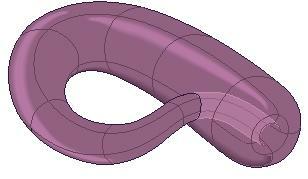 You can make a Möbius strip very easily. Simply cut a long strip of paper, twist the paper once, and connect the two ends of the strip to each other. The figure that results will look like the Möbius strip shown in Figure 4. Notice that an ant crawling along the Möbius strip will never have to pass an edge to go to "the other side." In other words, there is no "other side"; the Möbius strip has only one side. Riemann developed some of the most important topological ideas about the stretching, bending, and twisting of surfaces. Unfortunately, he died at the early age of 39, before getting the chance to develop some of his ideas fully. Klein is best known for the paradoxical figure illustrated in Figure 5, the Klein bottle. The Klein bottle is a one-sided object that has no edge. It consists of a tapered tube whose neck is bent around to enter the side of the bottle. The neck continues into the base of the bottle where it flares out and rounds off to form the outer surface of the bottle. Like the Möbius strip, any two points on the bottle can be joined by a continuous line without crossing an edge. This property gives the impression that the inside and outside of the Klein bottle are continuous.